Yosemite National Park inspires a diverse array of breathtaking visuals, from earthy paths quietly passing beneath Ponderosa pines to granite peaks spiking soft ponds of cloud. But the national park’s most poignant feature is easily Half Dome, a staggering granite crag whose profile has become inextricably linked to Yosemite. At nearly 9,000 feet, the formidable monolith has been a muse for both artists and thrill-seekers alike. In 1927, Ansel Adams famously captured the vertical slab of dome in his photograph “Monolith, the Face of Half Dome.” Fifty-two years earlier, in 1875, George G. Anderson defied skeptics when he reached the summit by drilling poles into the rock at five-foot intervals. Once cables were installed in 1919, hikers scrambled to the top of Yosemite’s iconic rock for unrivaled panoramic views of sprawling Yosemite Valley – and serious bragging rights. 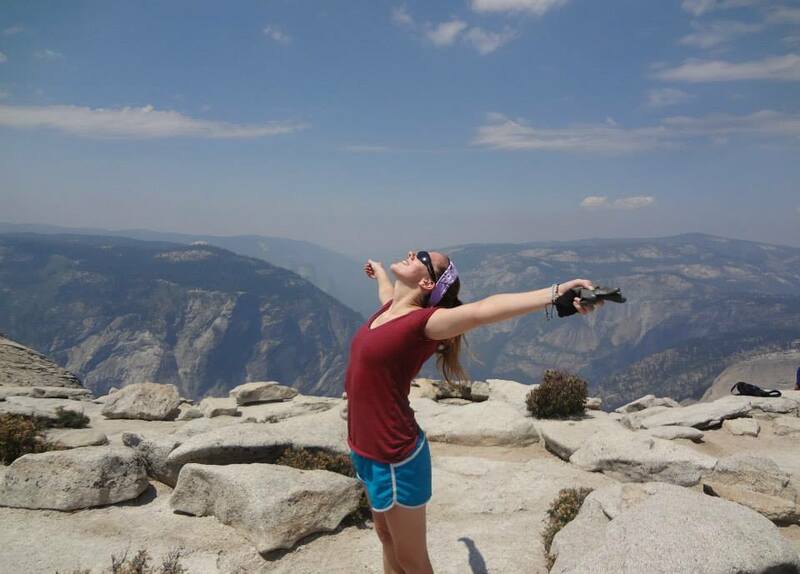 Shar: Want to hike Half Dome? Of course, the stony summit would not be so easily conquered. Half Dome serves as a beacon for ambitious adventurers, backpackers, and novice hikers alike; if it were open to everyone, the trails and cables would be clogged with summit-seekers, making it impossible to safely ascend and descend. 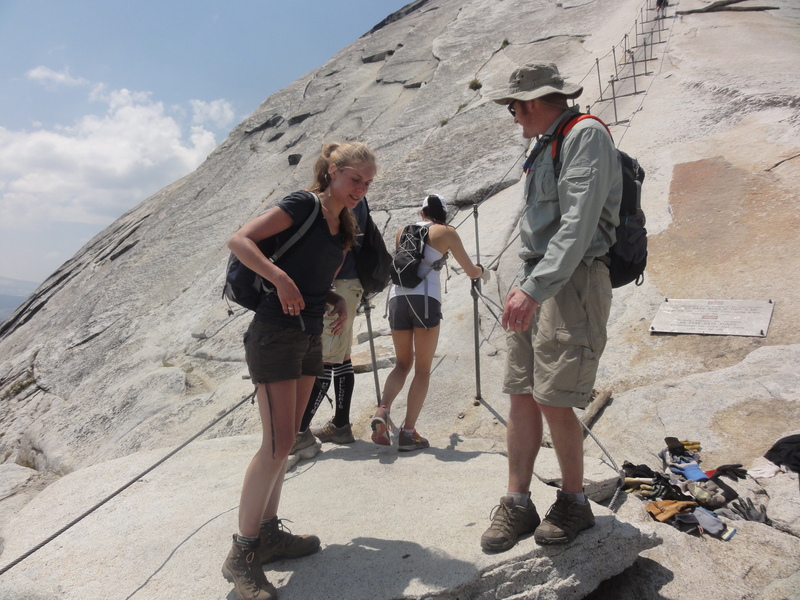 It is for that reason that a hiking permit is required to summit Half Dome. Sure, it’s possible to hike to Sub Dome – the equally daunting base of Half Dome – without a permit, but who wants to hike nearly 8.5 miles only to catch a glance of the intimidating summit? Obtaining a permit requires some planning and a pinch of luck. Not everyone can secure a permit, and Half Dome-hopefuls must enter requests into a daily lottery. According to the National Park Service (NPS) website, 86 permits were available per day in mid-June through August of 2012 and 21% of lottery applicants were successful. Fortunately, Shar had done her research (as always), and instructed me to call the number provided by Recreation.gov two days prior to our anticipated climb. It was with unparalleled excitement that we received the e-mail on Thursday morning, en route from Humboldt to Yosemite, informing us that we had been granted a permit for the cables on Half Dome. Even then, a successful summit is not guaranteed. Nature is a temperamental and unpredictable force; a clear day can be deceptively fickle and can quickly give way to thunderstorms. For good reason, the cables are closed when it’s storming. And no matter how close you are to the summit, if you hear thunder or notice a particularly grey and menacing cluster of clouds gathering overhead, you have to turn back – a frustrating task, especially for those in view of the cables. Conditions are so unpredictable that it’s hard to say when the cables will actually open: in the past, late snowstorms have delayed May openings as far as mid-June. The night before our hike, I entertained a few mild concerns about my ability to walk 8.5 miles up a mountain. There was a 40% chance of storms the following afternoon, and slippery cables combined with lightning meant no summit. In addition, it had been months since I’d engaged in any sort of physical activity, a result of a strange and lingering chest infection that turned out to be asthma. Over Skype, Cody informed us of the number of fatalities on Half Dome – a total of eight: six falling from the cables, two struck by lightning. A small number, but a stark reminder of the difficulty involved. Regardless, Shar and I woke up with enthusiasm at four the following morning. We had decided to hike the Cable Route from the trailhead at Happy Isles, an 8.5 mile hike almost entirely uphill. An informational pamphlet on the trails of Yosemite labeled Half Dome as ‘extremely strenuous,’ and it wasn’t exaggerating. We’d begun at ten to seven, in the chilly pastel light of dawn, and had barely been climbing a paved path for ten minutes when my lungs began to protest. After taking my inhaler – and eating six Gatorade chews – things were looking up. We made good time trekking up a series of sharp, rocky switchbacks that emptied us out at thundering Nevada Falls, a spectacular sight that marked the halfway point of our ascent. 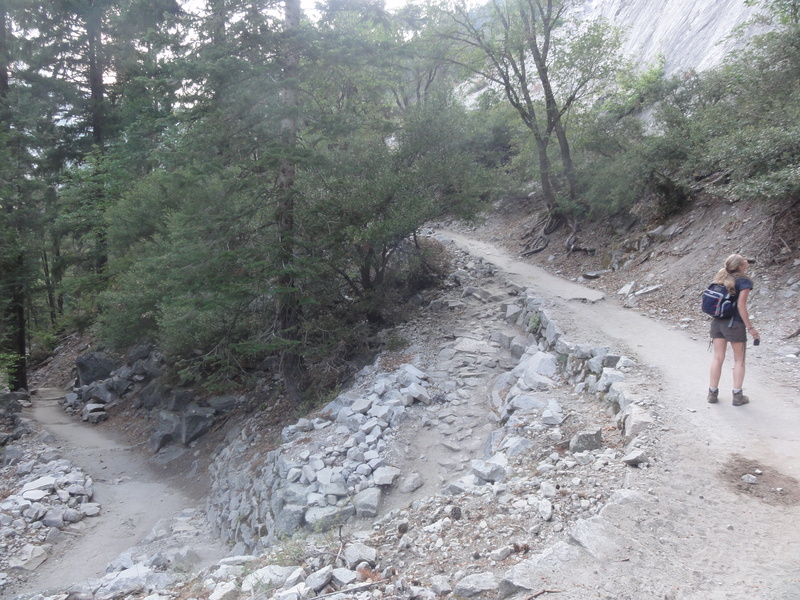 Prior to Nevada Falls, hikers had been scarce on the trails. In fact, the past two miles had been so isolated that we found ourselves clutching pepper spray and glancing fearfully up at steep, rocky outcroppings that would make easy perches for mountain lions. Nevada Falls, pinnacle of the popular Mist Trail, provided our first glimpse of other day hikers clustered around tour guides. Here, we rested for a while and hydrated. It’s necessary to pause for a moment to really emphasize how absolutely crucial it is to carry enough water. We’d been inundated with this information in pamphlets and along the trail, but we hadn’t heeded it. In my backpack, I carried a 1.5 liter bottle of water along with two 500 ml bottles I’d taken from the hotel. 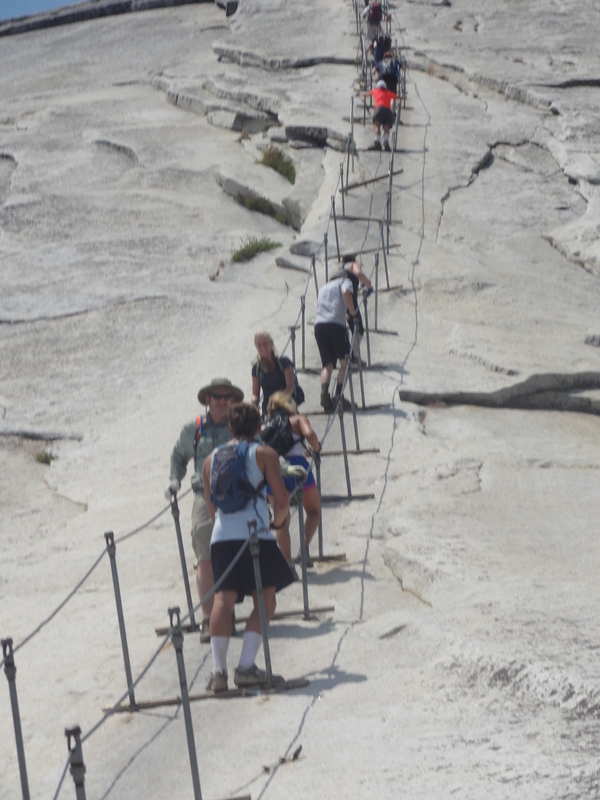 NPS suggests four liters to “enjoyably” complete the hike to Half Dome: we each carried less than two. 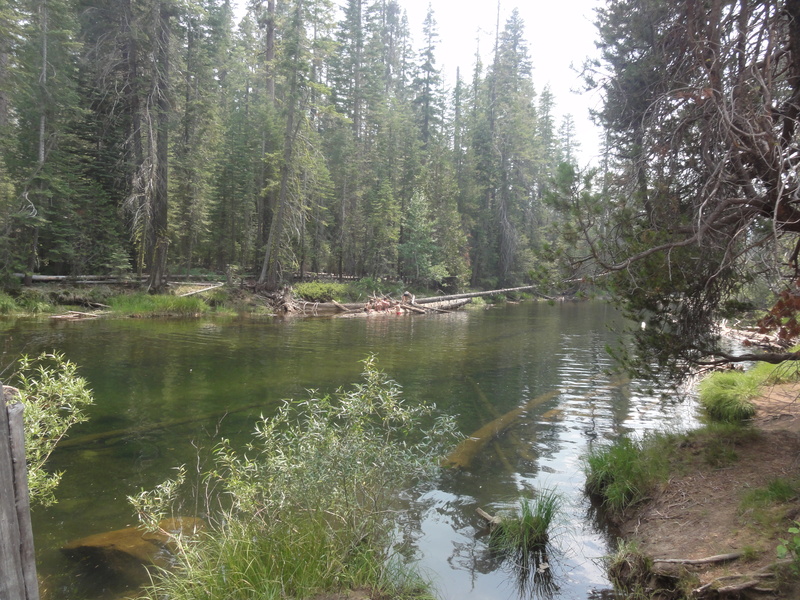 The 8.5 mile trail provides its last source of potable water about a mile and a half into the hike. By the time we reached Nevada Falls, we’d long since passed that point. We had refilled our bottles at the water fountain, and despite the arduous ascent, we hadn’t felt thirsty in the cool hours before noon. The descent would be a different story. Still, we hiked onward and upward with determination and high spirits. We were making good time: the informational literature estimated that, on average, the 17-mile trail can be completed in about 10-12 hours. We’d set off a little before seven and reached Sub Dome by 11:30. By the time we’d heaved up a particularly trying vertical section of trail, passing the two-mile mark on the way, our energy had nearly faded. It’s important to note that, from Yosemite Valley, hikers will ascend over 4,000 feet before summiting Half Dome. When compounded with thinner air at high altitude, the ascent earns another point toward its difficulty. Even with the promise of a little more than a mile remaining, the last stretch of trail was especially trying. Emerging from the tree canopy and into the final, exposed portion meant sacrificing shade for oppressive heat. 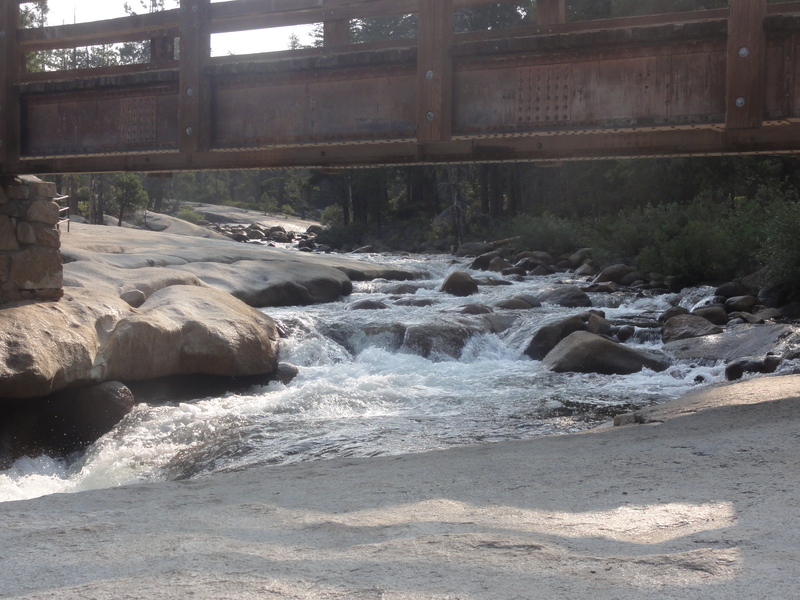 This was not enjoyable for anyone, and less so for ill-prepared, dehydrated hikers. Panting and struggling against the grade of the ascent, we felt incredulous each time an ebullient, backpack-less hiker trotted downhill past us, pertly wishing us luck and assuring us that we were nearly there. How were these people so energetic and upbeat? To say we looked disheveled in comparison would be a gross understatement. By the time we reached the permit check at Sub Dome, my attitude had gone from stoked to wary. My depleted energy levels coupled with my parched throat and single bottle of water remaining suggested that I might not last much longer. If we’d thought the previous seven miles had been rough, the next mile seemed nearly impossible. After checking our permits – technologically-savvy rangers are now equipped with iPads and require only your name, though it’s best to pack some form of ID – the rangers informed us that we would now hike up a set of ‘stairs,’ a climb that would take 30-45 minutes on bare, exposed granite. I wasn’t sure which was more worthy of panic: the fact that nearly an hour of climbing remained before we even reached the cables, or the fact that I hadn’t urinated in hours and felt ravaged by thirst. Shar and I paused in the shade on the bottom step, devouring chocolate bars in hopes of restoring some of our waning energy. As we ate, a man stepped jauntily down beside us, grinning. “You coming down or going up?” he asked. We told him. We set off again, this time up a smooth rock surface. There were steep, uncertain steps carved into the arc of the dome for the most part, but there were also wide plains of rock with no grips for feet – and no promises that you might not slip and careen down the side. Shar approached the gripless ascent with an enviable aplomb while I blundered on slowly, worrying over every step. And then – finally – we were there: the base of the cables. It felt better not looking at them. The cable system stretches up the last 400 feet of rock at a staggering 45 degree angle. Gloves had been suggested, but required would have been a more suitable word. Unsurprisingly, we hadn’t packed any. Despite the rangers’ admonition that gloves not be left in a sweaty heap at the base of the cable – an attraction for squirrels and rattlesnakes -, hikers toss their used accessories in the pile upon descent of the cables. Thank God. We’d intended to rest before making the final ascent, but I felt so weak that I seriously wondered if I would be able to rally myself after resting. With that, we each pulled on a pair of sweaty gloves and hoisted ourselves onto the cables. At first, the ascent appears easy. Using your arms, it’s fairly simple to pull your body up the first few feet of cables. Then, it’s not so simple anymore. Halfway up, I made the mistake of looking behind me to find all of Yosemite below, me suspended near-vertically on a rock face, upright only as long as my hands could clutch the cables. Should I let go, gravity would yank me backward and send me plummeting to my death. A glance to my left at the sheer, vertiginous line of Half Dome bisecting the horizon briefly caused me to question my sanity. I forced myself to face the rock, looking up at the man a step ahead of me. Each time he ascended the ten-foot gap between his plank and the next, I did the same. I would climb because I had to, because the only other choice was to fall off. This fear trumped my fatigue and pushed me to the summit, shaking and catching my breath on a jagged rock. The view was worth it. 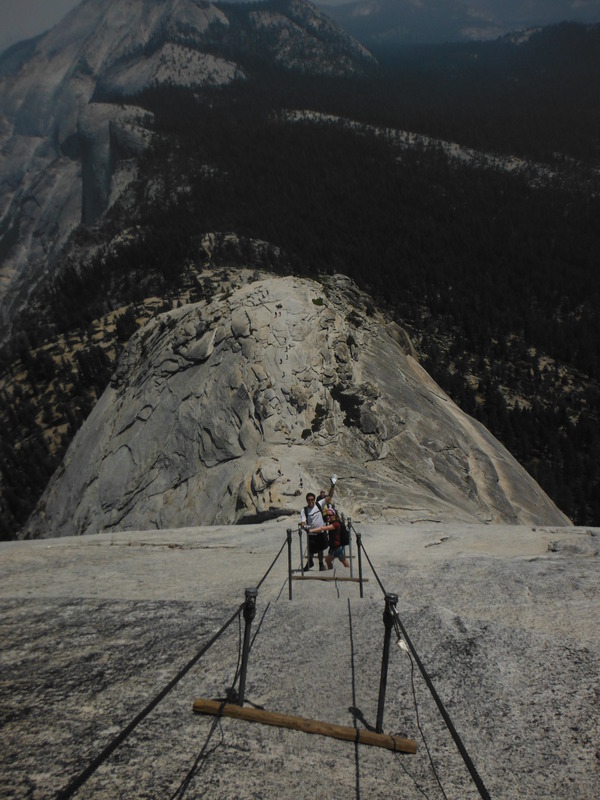 We stepped around to the other side of Half Dome and photographed the mountainous vista below. After finishing half of my remaining water bottle, I felt some of my strength return and my body stopped shaking. The threat of thunderstorms still loomed, so we rationed our time at the top and decided to begin our descent. Ironically, descending the cables is not nearly as physically demanding or terrifying as ascending. You would think that the height and the sight of the steep rock below would be paralyzing, but it’s not. We ran into two cheerful hikers we’d met earlier, Patrick and Hugh, and descended along with them. Patrick descended backwards, facing up at me, and my descent was that much easier having a person to anchor my eyesight and distract me from the spinning height. I adopted a slip-and-slide technique that I’d seen people doing on my way up: grab the cables and let your feet slide until they’re stopped by a wooden plank. This descent – and the injury-free descent of Sub Dome – kicked my adrenaline into full gear. By the time we re-entered the wooded path again, Shar and I were both feeling peppy and capable. Accomplished and energized, we took turns motivating struggling climbers, passing along the same assurances we’d received earlier. As predicted, the descent was breezy and even involved a quick detour to a section of river for a brief plunge into frigid water. But as hours ticked by and the sun rolled past three in the afternoon, we felt the impact of exhaustion and dehydration. We’d finished all of our water at the five-mile mark, with three miles to go. It’s hard to truly comprehend the power of dehydration. It’s downhill, and it’s only three miles. How bad could it be? We finally reached the switchbacks and descended down what seemed like an eternity of them before reaching an unmarked fork. Opting to go left, we ended up lost on an unused horse road. From the dusty trail, we could see the water station we’d been aching for – below us to the right, unreachable. The only option was to continue down and hope that the trail opened up to Happy Isles, as our map promised. Still, it was a bit of a gamble. Weary and unable to swallow even saliva, I worried that the trail would leave us at the riverbank in the valley, without any other option but to go back up, something I didn’t think I could do. At around five in the afternoon, after passing an abandoned construction site, we emerged onto pavement and encountered a family. “Which way is the trailhead?” Shar asked breathlessly. They pointed. “How long have you been hiking for?” asked the father. We both exchanged desperate looks before nodding. They generously doled out bananas and a bottle of blue Gatorade, which we chugged in under a minute. A few meters later, we happened upon a water fountain and spent a good quarter of an hour refilling our bottles, drinking them, refilling them, drinking them. We still had a ten-minute walk back to the car, but I was no longer worried. 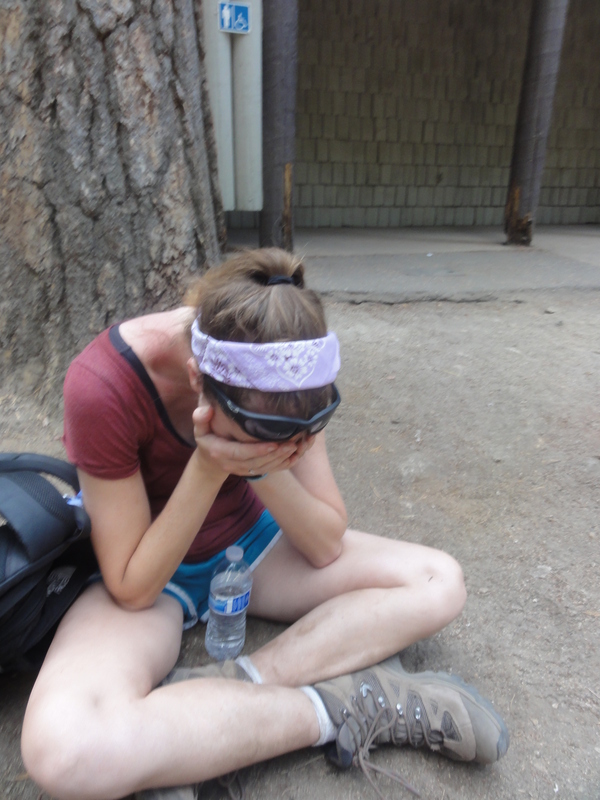 It is amazing what relief comes with removing hiking boots, sitting in a seat, and feeling properly hydrated. In the end, though we were unprepared, it was still an amazing hike, well-equipped with breathtaking views and bragging rights. Feeling both conquered and accomplished, we returned to the hotel. Not even a dead prospector would keep me from a solid, uninterrupted sleep that night. Bring lots of water! Four liters would be good, and if you have a CamelBak, bring that, too. Iodine pills could come in handy if you get desperate, or a filter pump. Get there by sunrise. Trails aren’t crowded and it’s a lot cooler – definitely a nicer way to experience nature. Ankle-supporting hiking boots make the rocky trails easier and prevent injuries. One of the most common injuries on the trail is a rolled ankle. Our Salomon boots were fantastic. If you don’t summit by 3:30 PM, turn around – you have another 8.5 miles to go. Summit before noon if possible. The cables are less crowded. The hike takes 10-12 hours. We did it in 9 (we didn’t count the lost horse trail) and didn’t stop much, but there’s no rush on the way down – lots of lovely views to stop and admire! Thunderstorms and rain prevent use of the cables. Don’t risk it! It’s $20 to enter Yosemite. You can pay upon exit if the booths are closed when you arrive. The pass allows re-entry for a few days after. 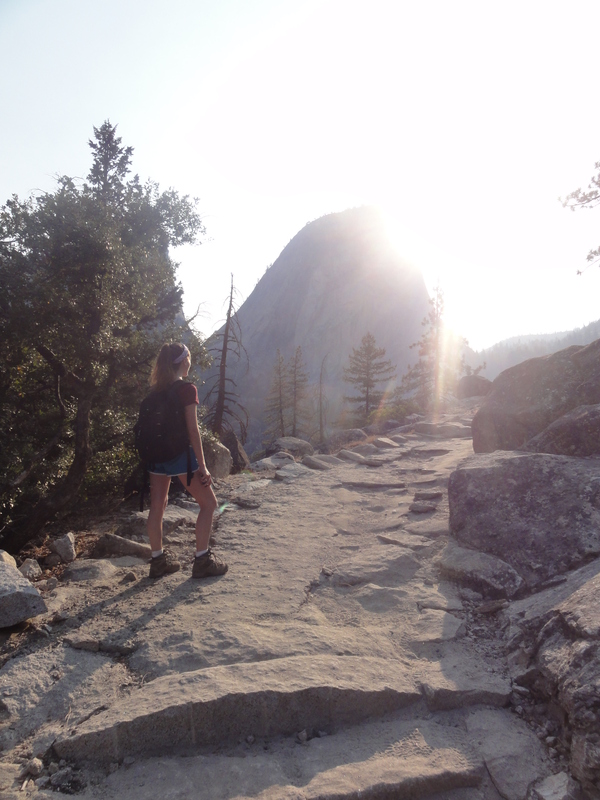 Park and walk to shuttle stop 16, Happy Isles, if you want to hike the full Half Dome trail. Trails are labeled on the way up. On the way down, they’re a little less frequent. Get a trail map. Gloves are a must on the cables. There’s a pile at the bottom, but if you have your own, bring them. Gatorade chews are a great idea! Six chews gave us lots of energy, kicking in fifteen minutes after eating them.